Author's note: Having a business background helped me to realize the target audience of this project, and using what I learned in this class, helped me develop a concise business plan to accompany my vision. Find-a-fourth.com is a website dedicated to the social aspect of golfing; designed to network golfers by geographic location. 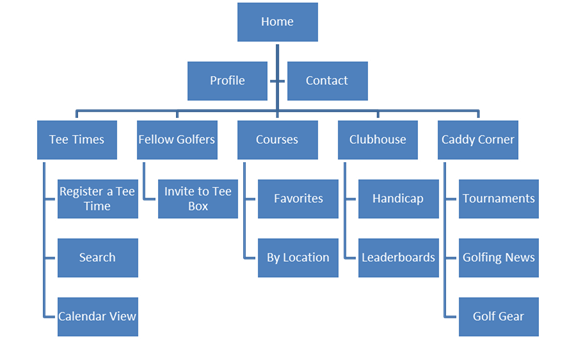 Once golfers register to the site there are a number of ways in which the user can leverage the site to their benefit. Golfers can create a profile, connect with other golfers, and find available courses/tee times to play with friends. The site is free to register (only requiring an active email address); however, if golfers want to enjoy all the site has to offer they have the option to “Go Pro” for a yearly subscription fee. The founding principle of find-a-fourth.com is to allow golfers to find friends on the tee box. In the PPC model businesses and advertisers will have the opportunity to purchase ad space on the website. The website will limit the scope of potential ad buyers to those comprising golf related items, products, or services. In the yearly subscription fee registered users will pay for full access to the site. Full access of the site allows the user to engage the website more interactively and the site can keep track of their handicap in accordance with PGA standards. In the “Caddy Corner” section of the website there will be links to various tournaments, tryouts, and practices around the users’ local area code/zip code. In addition, this portion of the website will have links to golfing news/trends, as well as, information of new golfing products and services. Golfers of all ages and from any location are welcome to register. The target market for the website is for golfers who feel a degree of isolation with the sport. There are a number of ‘single’ golfers that travel to various golf courses and “walk-on” to the course, usually with another unfamiliar group of three people. The mixing and matching of unfamiliar golfers is sometimes an uncomfortable experience and extremely long (3-5 hours) for everyone involved. The website serves to eliminate feelings of awkwardness and isolation among groups and individual golfers. Attacking the long-tail – the website hosts will actively seek other sites offering similar services across the world, and offer the ability to opt-in to the find-a-fourth.com vision. By attacking the long-tail marketers can find pre-established niche communities and expand business through a common space, while eliminating competition throughout the process. Viral marketing – the website will link activity into Facebook and Twitter to try and gain brand awareness and reach a bigger market share. The domain name find-a-fourth.com will eventually become a registered trademark, and will encompass any logos or insignia associated with the production and distribution of the domain name. The site hosts intend to register and classify all intellectual property as assets under copyright law.